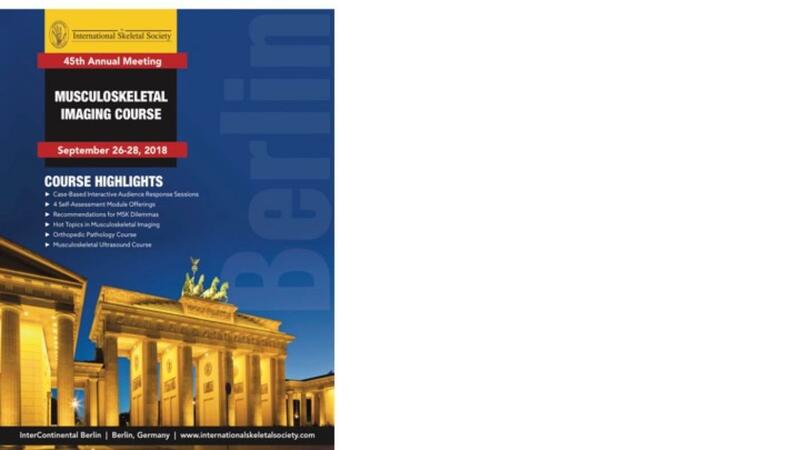 From September 23rd to 28th 2018 the 45th Annual Meeting and Refresher Course of the International Skeletal Society (ISS) will take place in Berlin. You are all cordially invited. With this 2018 ISS Annual Meeting leading musculoskeletal radiologists and pathologists will meet again in Europe. The highlight of the conference will be the Musculoskeletal Imaging Course: Fundamentals to Advanced Concepts from September 26 to 28, in which a cutting edge update in MSK radiology will be presented over 3 days by speakers from the Europe, US, Asia and other parts of the world. Please find the program attached to this mail. There will also be an MSK Ultrasound Course, and Scientific Sessions on September 24 and 25, as well as Radiology-Pathology Case Sessions.